ATLANTA (CNS) — Archbishop Wilton D. Gregory of Atlanta pledged to restrict the presence of guns in Catholic institutions in response to a new Georgia law that would allow licensed gun owners to carry arms into schools, churches and other locales. Set to take effect July 1, the law was opposed by the Georgia Catholic Conference. 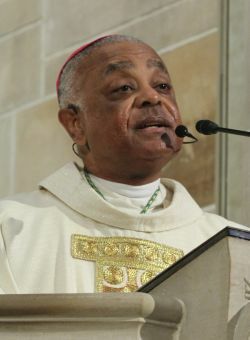 “Before this legislation takes effect in July, I will officially restrict the presence of weapons in our Catholic institutions except for those carried by the people that civic authorities have designated and trained to protect and guard us — and those who are duly authorized law and military officials,” Archbishop Gregory explained. “The last thing we need is more firearms in public places, especially in those places frequented by children and the vulnerable,” Archbishop Gregory wrote. Previously in Georgia, licensed gun holders were not permitted to carry a firearm into a house of worship. However, the law diminishes the penalty for carrying weapons in a house of worship to a $100 fine with no arrest permitted for a licensed gun holder. A person carrying a weapon without a license can be charged with a misdemeanor. Gov. Nathan Deal signed the Safe Carry Protection Act April 23, saying it strengthened the rights of gun ownership as outlined in the U.S. Constitution. When the bill passed the legislature in late March, Frank Mulcahy, executive director of the Georgia Catholic Conference, said he was confident the bishops and pastors of Georgia would take appropriate action to protect people entering churches. “The version of gun control that passed really offers churches no real protection, other than a fine for those licensed holders who might bring a weapon,” Mulcahy said. Archbishop Gregory, in his column, said, “Churches and other places of worship are intended to be sanctuaries — holy sites where people come to pray and to worship God. “In this nation of ours, they have seldom been the locations where violence has disrupted the otherwise peaceful atmosphere. Yet even those occasions — rare as they may be — are not sufficient reasons to allow people to bring more weapons into God’s house,” he said. “Yet this new legislation de facto makes firearms more available in places where they may allow violence to escalate,” Archbishop Gregory said. The law is wide ranging and, among numerous provisions, will allow carrying weapons in bars, in any government building not restricted or screened by a security officer and also in school safety zones if permitted by a duly authorized officer. The law provides a judicial licensing process for those judged mentally incompetent or not guilty of certain crimes by reason of insanity; prohibits local governments from regulating gun dealers or gun shows; protects those who claim to have inadvertently entered restricted parts of commercial airports; prohibits law enforcement from requiring production of a carry license when someone is carrying a weapon; and provides that defense of self and others is an absolute defense of any violation of weapon regulation. Archbishop Gregory and Bishop Gregory J. Hartmayer of Savannah, Ga., had issued fervent pleas for lawmakers not to adopt the law and were joined by other faith groups and individual churches in their opposition to the legislation. Golden is on the staff of the Georgia Bulletin, newspaper of the Atlanta Archdiocese.